Twenty-five riders each took two trips down a course that, by many of their accounts, should not have been open for action. Of the 50 runs, 41 ended with a rider on her backside, or in a face plant, or, in the case of Canadian Spencer O'Brien and a few others, in a slow ride toward the bottom after simply pulling up because they couldn't build enough speed to reach the crest of a ramp. "All I wanted to do," said fourth-place finisher Silje Norendal, "was sit up top and cry." Even Anderson — the sport's biggest gamer and its No. 1 big-day rider — conceded, "I'm not extremely proud of my run." Her modest score of 83 resulted in a blowout of nearly seven points over silver medalist Laurie Blouin of Canada. "It was a lottery," O'Brien said. On this day, Anderson was never tempted to try that kind of trick. Her three jumps at the bottom consisted of a backside 540, a cab 540 and a front 720 — 1½ twists, 1½ twists and two twists. It was the sort of run that might've won a contest in 2008 — if the rest of the riders were having an off day. "I was trying to keep the spirits high, like, 'Let's run it,'" she said. "A handful of the girls were like, 'No, it's not safe,' and things like that. It's not like what we're doing is safe, anyhow." The 27-year-old from South Lake Tahoe, California, would've been favored to win under any conditions. Her Zen-like mindset is a big part of the equation, and she was ready to go when her alarm went off Monday — wind, snow or shine. "It's having the experience, and learning to deal with what is," Anderson said. "It's not always going to be perfect. A lot of times, everyone's like, 'It's going to be perfect in a couple days.' But yesterday we canceled the event, and we woke up today, and it was just as windy or worse." 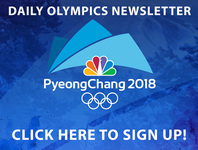 Given the ugliness of the day, a few questions loomed: Why were organizers so quick to cancel the men's downhill Sunday and the women's giant slalom Monday in other parts of the mountains of Pyeongchang but insistent on staging both the men's and women's slopestyle contests? And what considerations were made for NBC, which pays billions to televise these events live in prime time in the United States? Roby Moresi, the contest director for the International Skiing Federation, told The Associated Press that safety, not TV, was the primary concern, and that winds on the Alpine mountains were much stronger than what whipped around on the slopestyle course. He said the complaints that reporters were hearing at the bottom of the course didn't mirror what officials were hearing up top. "We didn't get much of a pushback," Moresi said. "Of course, there's a lot at stake and maybe they don't express as much. But we only got complaints from one team. Others were comfortable. Others were telling me, 'You did the right thing by making it happen.'" "I'm glad nothing happened to me today," said Austria's Anna Gasser, one of the world's best riders, who fell twice and finished 15th. "I think today," Gasser said, "made us look way worse than we are."